Google has been rolling out new Google support forums slowly. AdWords, AdSense, Google Mobile Maps, Google Analytics, Google AdManager all have been moved over. I am in the know that Google Webmaster Support is moving over soon as well. I have also taken a full size screen capture of the page and posted it on Flickr. I hope for everyone's sake that these new forums are able to handle these spammers. Cause it is only going to get worse as Google moves more support areas to this format. The problem is now solved (all the spam has been deleted). These 'spam attacks' happen from time to time in our forums where one person or a small group of people will go in and post a good deal of spam all at once. One of the great features of the new Google forums is the "report abuse" function that allows users to identify possible spam for removal so they can flag it before Googlers catch it. When users report spam, it gets routed to our abuse team directly, which will shorten the TAT on spam removal significantly, especially on smaller forums. Guides (at Google) can also remove spam as soon as we see it by deleting single posts or entire threads. 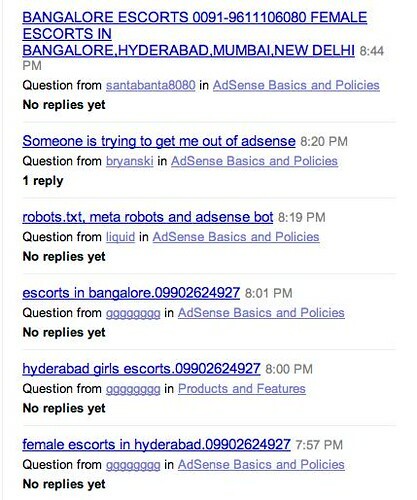 Previous story: Google AdSense Ads Getting Spammy Before Holiday Season?